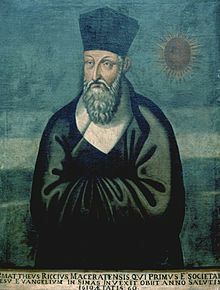 Matthaeus Riccius, unus e primis sinologis Europaeis. Imago Sinica, anno 1610 facta. Sinologia est academicum Sinarum studium, plerumque per linguam, litteras, culturam, et historiam, quod saepe eruditionem Occidentalem attingit. Eius origo "ab indagatione quam eruditi Sinici suarum civilizationis fecerunt repetere potest." Disciplina sinologica pro philologia ad Sinas adhibita valere olim videbatur, et usque ad saeculum vicensimum 'philologia Sinica' (linguae et litterarum) tantum significare plerumque videbatur. Sinologia temporibus recentioribus in latitudinem crescit ut historiam Sinarum, epigraphiam, aliasque res comprehendat. Vocabula sinologia et sinologus Anglice circa annum 1838 facta sunt, et praefixum sino- a Sinae verbo Latino a Sinai verbo Graeco, vicissim a Sin verbo Arabico, quod demum a qin, domum Qin significante, derivare potest. In studiis regionalibus, usus Europaeus et Americanus inter se discrepare possunt: in Europa, sinologia studia Sinica usitate appellatur, sed in Civitatibus Foederatis, sinologia est subdisciplina studiorum Sinicorum. In Asia Orientali, coeperunt studia rerum ad Sinas pertinentium antiquitate. In Iaponia, sinologia 漢学 kangaku 'studia Han' appellabatur. In Sinis autem hodiernis, studia rerum ad Sinas pertinentium studia nationalia (Mandarinice 國學, simpliciter 国学 pinyin Guóxué, Wade-Giles Kuo2-hsüeh2) appellatur, et sinologia in studia Han (漢學, simpliciter 汉学, pinyin Hànxué, Wade-Giles Han4-hsüeh2) convertitur. Voltarius L'orphelin de la Chine ('Orbum Sinicum') ludum docuit, ab Orbo cuiusdam Zhao motus, et Leibnitius Novissima Sinica scripsit. Studium Sinarum et linguae Sinicae in Francia coepit Ludovico XIV regnante, qui anno 1711 quendam Arcadium Huang, iuvenem Sinicum, ad regale textuum Sinicorum corpus perscribendum designavit. ↑ Anglice: "may be traced to the examination which Chinese scholars made of their own civilization." ↑ American Heritage Dictionary of the English Language (Bostoniae: Houghton Mifflin, ed. 3a, 1992), 1686. Asato, Noriko, ed. 2013. China. Handbook for Asian Studies Specialists: A Guide to Research Materials and Collection Building Tools, 25–134. ABC-CLIO. ISBN 9781598848434. Barrett, Timothy Hugh. 1989. Singular Listlessness: A Short History of Chinese Books and British Scholars. Londinii: Wellsweep, 1989. Cayley, John, et Ming Wilson, eds. 1995. Europe Studies China: Papers from an International Conference on the History of European Sinology. Londinii: Han-Shan Tang Books. Cole, James H. 2003. Twentieth Century China: An Annotated Bibliography of Reference Works in Chinese, Japanese, and Western Languages. M. E. Sharpe. ISBN 9780765603951. Honey, David B. 2001. Incense at the Altar: Pioneering Sinologists and the Development of Classical Chinese Philology. Portu Novo: American Oriental Society. ISBN 0940490161. Mungello, David E. 1985. Curious Land: Jesuit Accommodation and the Origins of Sinology. Stutgardiae: F. Steiner Verlag Wiesbaden. ISBN 0824812190. Wilkinson, Endymion. 2012. Chinese History: A New Manual. Cantabrigiae Massachusettae: Harvard University Asia Center, Harvard University Press. ISBN 9780674067158. Yang Liansheng. 1969. Excursions in Sinology Cantabrigiae Massachusettae: Harvard University Press. Yunshan Ye. 2014. ALA Guide to Researching Modern China. American Library Association. ISBN 9780838912096. Zurndorfer, Harriet. 1999. A Brief History of Chinese Studies and Sinology. In China Bibliography: A Research Guide to Reference Works About China Past and Present, ed. Harriet Zurndorfer. Honolulu: Brill. Iterum impressus, University of Hawai'i Press. ISBN 9004102787. Chinese Civilisation Centre. City University of Hong Kong. Sinology Project. University of Massachusetts, Amherst. Novissima mutatio die 21 Octobris 2017 hora 21:06 facta.